Published on October 23, 2015 by Martyn. Be the first to comment! 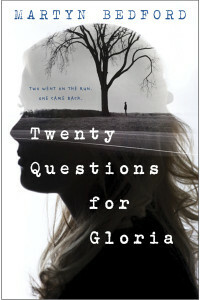 The American edition of Twenty Questions for Gloria isn’t published until April so it’s both surprising and delightful to receive a rave review of it this week – especially as the piece was written by a young reader and critic from the wonderfully named town of Moscow, Idaho. “When young Gloria meets mysterious new boy, Uman, they soon become taken with one another and embark on a fantastic adventure that changes their lives. And while it thrills Gloria to do something so spontaneous, she soon finds that she may be in over her head. This book is wonderful in so many ways. Though it is unlikely that anything that happens in Twenty Questions For Gloria would occur in real life, it perfectly conveys the emotions the typical teenager might experience: feelings of betrayal, intense trust and helplessness.